I will also provide a compatibility CD that will allow the game to run under ALL VERSIONS of Windows 10, 8, 7, Vista and XP, both 32 and 64 bit. Note that online play no longer functions. Sid Meier's Gettysburg was a remarkable wargame that managed to balance realism and accuracy with a user-friendly design and stylish visuals. 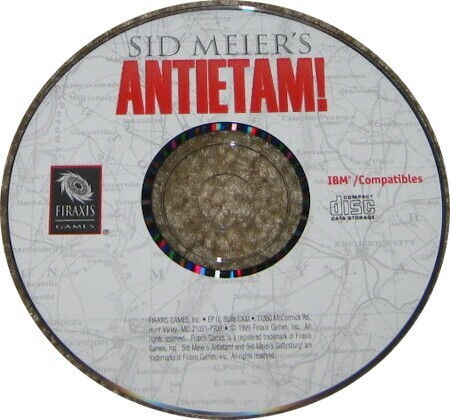 Sid Meier's Antietam is also an impressive game that builds upon the foundation established by the original. Available exclusively from Firaxis' web site, it offers no dramatic graphics overhaul or drastic redesign - just a new setting, new subject matter, and more of the same great Civil War strategy, which is nicely refined through a series of subtle enhancements. 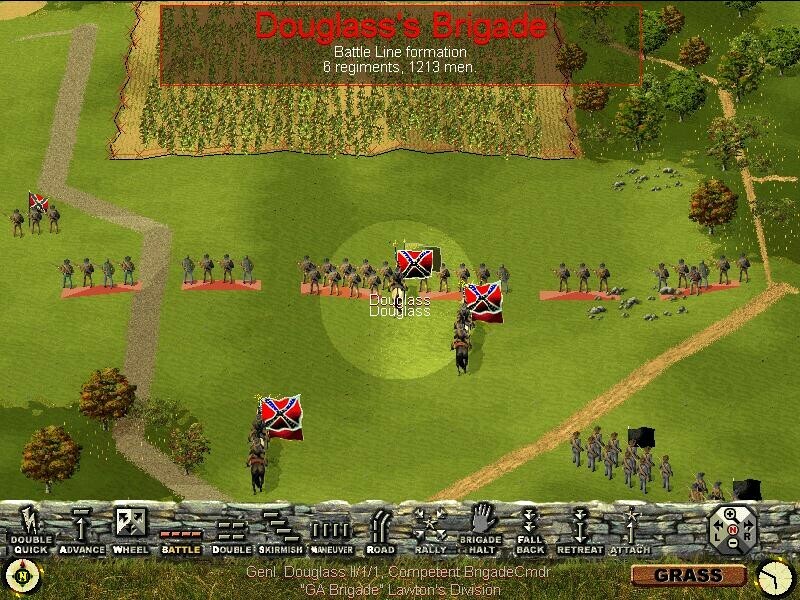 Antietam is based on the same game engine as Gettysburg and offers the same easy-to-use commands and menus. Moving troops requires a simple drag of the mouse, while facing and formation commands are marked by large, unmistakable buttons along the bottom of the screen. Icons indicate each unit's name, type, strength, experience, and current morale. You can also see if a unit is currently flanked or backed up by nearby supporting troops with a quick glance at the status bar. Though most of the graphics in Antietam are just as they were in Gettysburg, there are a number of improvements that give the game a sleeker overall appearance. The battlefield itself is more dynamic because it has several new types of terrain and other features to liven it up. Antietam Creek itself is one natural obstacle you won't soon forget, as troops can only cross it by using one of the few bridges or finding a ford, neither of which is easy to do. This can definitely cause some headaches for the Union commander, as many of the northern troops enter the battle from the far side of the creek. Also, troops move slower through some areas of the map, such as wooded hills, and units get defensive bonuses in covered terrain, such as forests and cornfields. One other notable enhancement is the inclusion of more uniquely uniformed units. If you look closely during a battle, you will notice units on both sides of the battle wearing decidedly different clothes from their comrades. Some of the most recognizable units include the US Sharpshooters and the flamboyantly dressed Zouaves on both sides of the battle. However, regardless of their dress, units still move, fire, charge, and retreat in exquisite detail. Gameplay during the heat of battle is largely unchanged from Gettysburg, which is a good thing. Before each scenario, you are shown where your objective lies and which of your units are the most reliable. After a battle, you get a rundown of the units that fought most effectively. Each scenario is timed, so you have to reach your objectives quickly and hold them until the clock runs out. When one side loses possession of an objective just before time expires, the game length is extended a bit. After completing a scenario, you even have the option of returning to the action to continue fighting. However, this would be a better feature if you could select the amount of time you wanted to add to the game clock. As it stands, you generally fight for another five minutes before the game declares the scenario is complete again.Most of the noticeable gameplay changes are for the better, such as explanations for the game's "Can't do that General" error messages - now you can see why a unit cannot charge when you order it to do so. You can also see how effective your attacks are, as the game indicates how much fire the selected unit is taking and receiving at any given moment. The biggest difference between Antietam and Gettysburg is the subject matter and its effect on the structure of the game. The battle of Gettysburg lasted three days. On the other hand, Antietam ran the course of a single, bloody day. As a result, you don't play through this game in a series of engagements while trying to amass a sufficient total of victory points to win the overall battle. Instead, you fight the entire battle, beginning at 5:50 in the morning and going right through to the early evening. This can be quite a handful, as the entire battle can last up to ten hours of real time (you can save the game at any time). It also forces you to manage your troops wisely, since not all units are available as the battle opens. In fact, some divisions do not become available until very late in the day, so success depends upon your ability to pace your troop movements and attacks. Fortunately, you do not have to play the entire battle each time you load up Antietam. The game also offers chunks of the battle in more than 20 neatly wrapped scenarios, including both historical and hypothetical variants. In addition, the game's random-scenario generator lets you whip up an "instant action" battle ranging from a small skirmish to a major engagement. However, the random-scenario generator is not all it could be, as it often locks you in a little too close to the realities of the battle. For example, almost all of the small skirmishes end up being fought in and around the East Woods, which tends to get tiresome after a while. It also would have been good to be able to pick the main objectives and the relative troop sizes. Sid Meier's Antietam is essentially more of the same great, approachable wargaming action that Firaxis gave us in Gettysburg but has been refined and enhanced for better gameplay.